Why Does The Earth Pull On One Side Of The Moon More? Is The Moon Lopsided? The Moon is pretty round; it’s set up much like the Earth – with a core of iron, surrounded by a mantle of other rocks, and topped off with a crust between 21 and 27 miles thick, at the surface. As far as we can tell, each of those components is pretty perfectly centered within the sphere that makes up our Moon. Could we tell if the mass of the moon were offset somehow? Let’s say the near side of the Moon were made of denser rock (more mass per unit area) than the far side for some reason. What measurements would that change? It wouldn’t necessarily change the elevation mapping; after all, you can just as easily have a large pile of dense rocks as you can have a large pile of less dense rock. However, what would change is the gravitational field mapping. In order to better understand exactly this sort of question - are the rocks over here roughly the same density as the rocks over there - we have mapped out very detailed measurements of the gravitational pull surrounding a number of other worlds - not to mention our own. The final result looks like the image below (when unfurled from the sphere of the Moon), when viewed through the eyes of the twin Gravity Recovery and Interior Laboratory (GRAIL) satellites. These two satellites, dubbed Ebb and Flow, orbited the moon for nine months in 2012. These maps allow us to rule out the Moon’s mass being completely lopsided, because there's no asymmetric gravitational pull being measured. If the Moon's mass were lopsided, you'd expect to see a huge swath of high gravitational pull along the left and right edges of the map, which we don't see here. 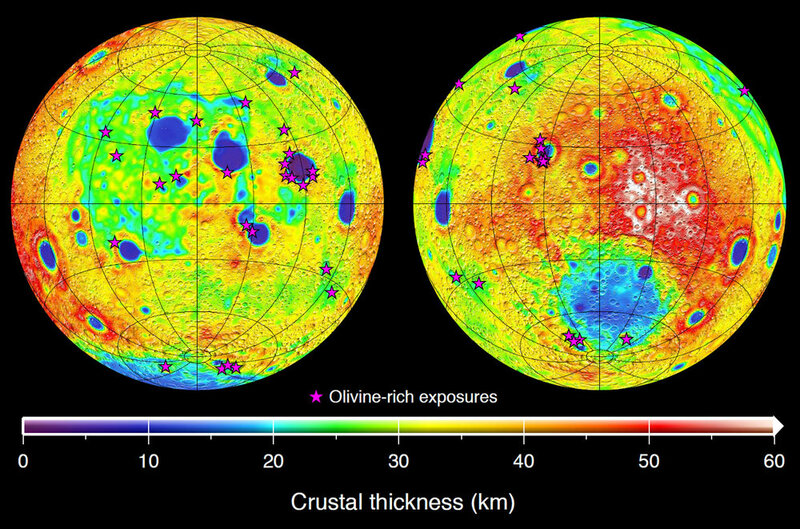 These maps show us the gravitational acceleration above each of these locations, and typically the punches you see in the surface - the red circles scattered across the Moon - coincide with impact craters we know about. So if the Moon isn’t lopsided inherently, what is it that causes the Earth’s gravitational pull on one side to be significantly stronger than the pull on the far side? This question works in both ways, as it’s the Moon’s reciprocal pull on the Earth which causes high tide. The answer is simply distance. Gravitational pull weakens with distance; in fact, if you drift twice as far away from an object, the gravitational pull weakens by a factor of four. Drift four times further, and gravity loosens by a factor of 16. Now, the near side of the Moon and the far side of the Moon are only 2,159 miles apart from each other. If you want to get a general handle on the gravitational pull between the earth and the Moon, you can do the calculation assuming the Moon is a mass collected into an infinitesimally small point. This will get you close to describing the orbit of the Moon around the Earth, but it glosses over a few details. One of those details is the difference in gravitational force on the near and far surfaces, knowing that the moon isn't flat. Because the Moon’s front side is 2,159 miles closer to the Earth than the far side, the gravitational force on the near side is just a tad stronger than the gravitational force on the far side. This is not a strong effect, but it is measurable, and it is this differential across the planet and our moon which causes both the liquid of our planet's oceans to pull towards the moon, and the same side of the moon to always face us.